Home » video » How to Convert MP4, AVI, FLV, WMV to WebM on Mac and Windows? How to Convert MP4, AVI, FLV, WMV to WebM on Mac and Windows? In mention of WebM, we all know it features open-source, smaller file size and high-quality. Since the announcement of WebM intended for use with HTML5 video by Google, the support for WebM is on the rise. It is widely supported by Mozilla Firefox 4, IE9, Safari, Opera 10.6 and Google Chrome and more. It will become the defacto video format for web video. Thus, converting video to WebM is becoming much more needed and popular. 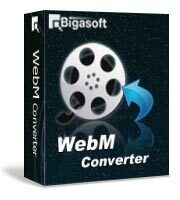 This article will introduce a powerful Bigasoft WebM Converter and a step by step guide on how to convert video to WebM with this WebM Converter tool. Free download the professional WebM encoder - Bigasoft WebM Converter (Windows Version, Mac Version), install and launch it, the following interface will pop up. Click the "Add File" button to import MP4 file to this WebM Converter. Or simply drag and drop this file to the main interface of this software. In fact, the default output video format is just WebM format, so just do nothing in this step. If the default output video format is not WebM format, click the drop-down button on the right side of the "Profile" button to select WebM Video Format (*.webm) as output video format. The ideal WebM encoder also provides advanced functions for you to edit video before converting the video to WebM video format. "Trim" function is for you to trim wanted video clip by setting the start time and end time. "Preference" function is for you to set preferred output video folder, output snapshot folder, image type, after conversion done action, CPU usage etc. "Settings" function is for you to set output video size, video quality, audio quality, adjust audio volume, and choose audio channel and more. Click the "Start" button to start to convert MP4 to WebM, it will be finished in few minutes. The above guide also applies to converting WebM video to other video format. The only difference is in step 2 and step 3: Add WebM file instead of MP4 file in step 2; Set preferable video format as output video format instead of WebM format. 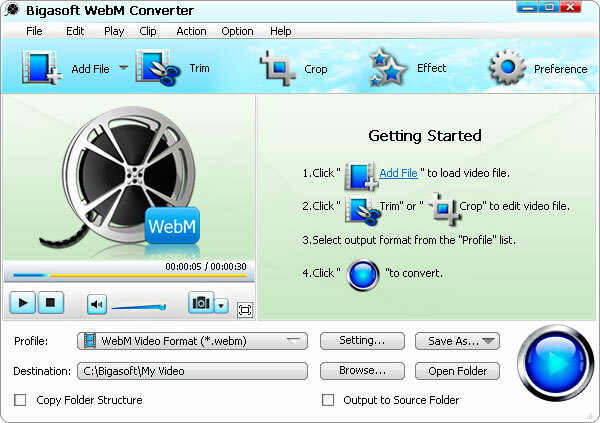 It is just easy to convert various videos to WebM with the above guide! Just come on and create the popular WebM from your various videos!